When report card time approaches, there may be a little tension in the air. Encouraging your children to excel in school and complete chores can be tough. Reward your daughter for her diligent work and show her how proud you are with a special bracelet, complete with your choice of unique CHARM It! charms. Personalize the reward for completing homework and acing assignments with a set of charms picked out just for your child. 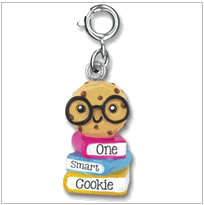 The One Smart Cookie Charm has a cookie wearing glasses and a stack of books. Let you daughter know she deserves recognition for all her hard work. You can also choose from treat charms like a cookie, donut, cupcake, cinnamon roll, rainbow ice pop and ice cream cone charms. These colorful decorations are the cutest miniature versions of their favorite snacks. There’s even a hamburger and fries charms! You can also choose from jeweled charms in an assortment of shapes, colors, and characters. Find animal, dance, Disney, Fashion, and music charms that match your daughter’s hobbies and passions. Whether it’s completing housework, doing well in class, or reaching a milestone, the CHARM IT! Charms are a delightful surprise that you can be certain your daughter will show off to her friends. Take a look at all charms today by visiting us at CoppinsGifts.com! You’ll find the perfect charm for the occasion and some for the next couple as well! Although the movie came out in 2013, Frozen continues to be a fan favorite for adults and children alike. The story of sisters overcoming odds and facing fears is filled with fun music and lovable characters. Your family can celebrate their favorite silly sidekicks and pretty princesses with Disney Tradition collectibles from Coppin’s Gifts. You can give a gift of a Frozen themed Jim Shore figurines and start your collection with one of these beautiful figurines! Do you have a daughter or granddaughter who dances around the living room screaming “Let it go, let it go!”? Her Frozen fandom is likely unmatched in your household. If her loyalties lie with Elsa, she can choose between the figurine with the Ice Castle Dress or the Be Yourself Personality Pose. For everyone else who wants to build a snowman and can’t get enough of the lovable, laughable Olaf, there is a Silly Snowman Figurine that is the perfect gift. Jolly Olaf will get everyone pumped for the holiday season. 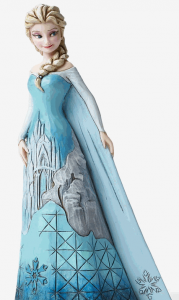 Start shopping for your next Frozen figurine and browse other Disney Traditions characters when you at CoppinsGifts.com today!